Situated just next to the vibrant township of Bandar Puteri Puchong, Mutiara Square shop offices will cater to the daily needs of residents. Fronting Persiaran Saujana Puchong, shop owners can tap into a ready catchment of 30,000 residents in their immediate neighbourhood, namely Taman Mutiara Indah, Taman Saujana Puchong and Laman Granview. Being part of the 82.5 acres development in Mutiara Indah, Mutiara Square is the final commercial phase which features 20 limited units only. The shops design are aesthetically pleasing and practical, layout are designed for greater flexibility to suit any type of businesses. The wide frontage, double-leaf main glass door and ample car park will make Mutiara Square shop offices ideal for retail, F&B and other services. 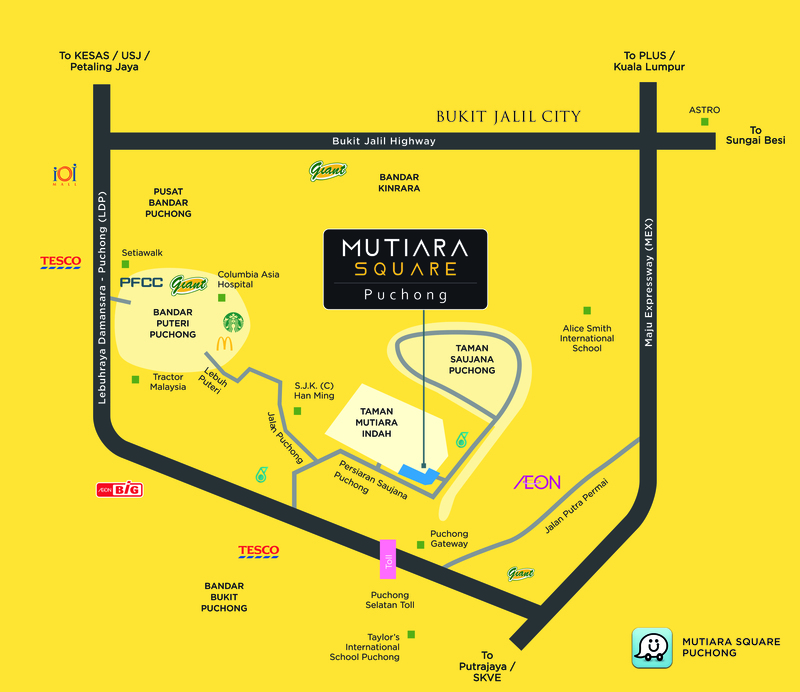 Mutiara Square is strategically located with easy access to Bukit Jalil Highway, Lebuhraya Damansara – Puchong (LDP) and Maju Expressway (MEX).